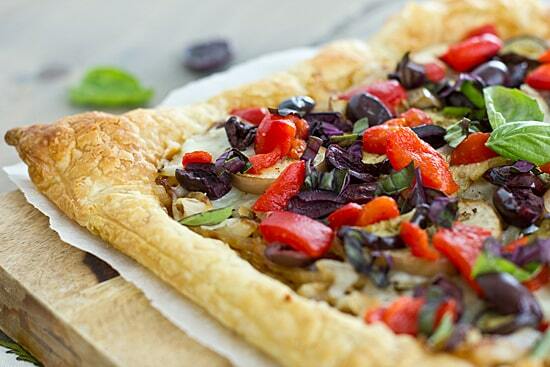 Unfortunately, this Caramelized Onion & Eggplant Puff Pastry Tart does not have truffle oil. (Although I suppose if you really wanted to, you could add some. I mean, it’s a free country, right? Do what you want!) But! It does have caramelized onions, olives, roasted red peppers, and basil. It’s a veritable quadrifecta of deliciousness. After I made this Leek & Olive Tart from Rikki Snyder’s food photography blog, I had a leftover puff pastry sheet sitting in the freezer, just begging to be made into something awesome. My little finger eggplants have been producing like crazy, so I roasted two of those, along with a small rosa blanca eggplant from the farmers market, as a topping. Everything else was simply what I had in the refrigerator that needed to be used. With a thrown-together recipe like this, there’s usually a high failure rate (at least in my kitchen, there is), so I piled on the toppings and crossed my fingers. See guys? Best thing I ever made. But it’s not so much because I’m amazing. (Although you’re welcome to think that I’m amazing.) It’s because when you add caramelized onions, olives, basil, or roasted red peppers to anything, it’s going to be delicious. There’s just no way around it. 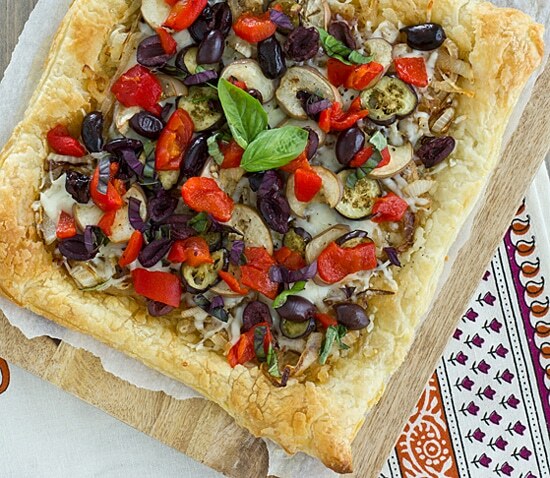 A puff pastry crust topped with caramelized onions, roasted eggplant, kalamata olives, and roasted red peppers. So much deliciousness! Spray a rimmed baking sheet with olive oil or cooking spray. Place eggplant slices onto sheet and spray tops with additional olive oil. Season with salt and pepper and roast for 20-30 minutes or until softened and just beginning to brown, turning slices over halfway through cooking time. Remove from oven and set aside. Lower oven temperature to 400 degrees. While eggplant is baking, start caramelizing the onions. Heat olive oil in a large skillet over low heat. Add onions and a pinch of salt. Allow onions to slowly caramelize, stirring occasionally at first and more frequently once onions begin to brown. Depending on your stove, this could take anywhere between 30 minutes to an hour. Be patient–it’s worth it! Remove from heat. Place rolled-out puff pastry dough onto a baking sheet that’s been lined with parchment paper. Bake for 10 minutes or until golden brown. Remove from oven and use a spoon or spatula to push down the center of the crust, leaving about a 1-inch margin on all sides. Spread caramelized onions onto crust. Top with cheese, then roasted eggplant slices, olives, and red peppers. Return to oven and bake 5 minutes, or until cheese has melted. Scatter basil ribbons onto tart just before serving. Garden Update | Long Beans: Delicious But Slightly Creepy Looking What I Ate This Week | Cantaloupe is not a substitute for mango! This looks like heaven in a puffy, pillowy crust. Enough that I might actually try it even with eggplant in it! HA! Oh that does look exceptionally tasty! It is! If I do say so myself. And I do. That looks great!! I’m so jealous of your little eggplants; they’re my favorite kind and I can’t find them right now. I will mail some to you–I have more than I know what to do with! Eggplants must really love the climate here. I could never get them to grow in Wisconsin, but here, they grow like crazy. Oh my…why do you have to make everything look so GOOD! I don’t eat eggplant but would consider eating this. There are so many other good things on here, you probably won’t even notice the eggplant! Ooh that looks good! There’s just something about caramelized onions that wins me over every time! Caramelized onions are one of my favorite things ever. It’s a pain waiting for them to cook, but it’s so worth it. This is something I would probably never make for myself, because (suprisingly enough) I tend not to use ingredients like caramelized onions, olives, or roasted red peppers in my cooking! But you’ve definitely piqued my interest now – even though I’m not a huge fan of olives, that tar looks delicious! I think I may overuse caramelized onions, olives, and roasted red peppers. 🙂 I guess we all have those go-to ingredients that we rely upon! This is beautiful. So prefect for a summer dinner. …and it tastes even better than it looks! This looks so good. You have the best ideas ever! I think you can add caramelized onions to anything and it will be delicious! This does look amazing! I would also add cheese to the list of items that always make a dish taste good, especially melted cheese .. mmmm! That looks so delicious…and wouldn’t you know…I have a few sheets of puff pastry left in my freezer too. Now I have to get all the other ingredients! Sunday dinner will be delicious this week. Thanks for the recipe post. Look at all those colors! Yummy! Did you roast the red peppers ahead of time? I can’t agree on the olives, but the rest of it looks truly amazing! I love the combination of eggplant and caramelized onions. And the finger eggplants are cool! Never seen or heard of them. 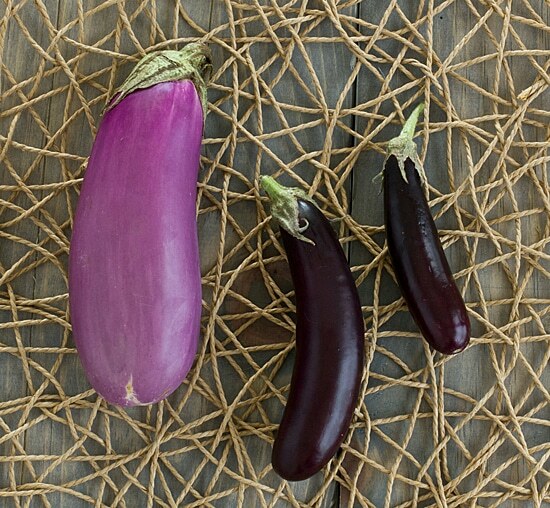 Little finger eggplants are awesome–because they’re so small, it only takes a few days for them to be ready to eat! And the plants produce a LOT of little eggplants. That looks amazing, I have some eggplant in the garden I am getting ready to pull off the plant! I’m getting new eggplant almost everyday right now. So! Much! Eggplant! What a gorgeous picture! I can’t believe I’ve never cooked with puffed pastry. This needs to change. The olive & leek tart I made from another blog a few weeks ago was actually the first time I used puff pastry myself! Mmmm, I have been dreaming up a savory puff pastry tart in my mind for a few months now but have never gotten around to making it (although when I do it will include Brussels sprouts and bacon, that much I know for sure, haha). Your recipe is making me think I need to make something like this soon! Yum! I recommend to use feta cheese instead of the italian cheese. It gives a great rich taste to the whole combination! Oh this looks and sounds divine! I love using puff pastry! Hi! This is the first time I saw your site. Everything looks and sounds delicious! I have a few quick questions… What is puff pastry? Where would I find it in the grocery store? Would it be found with the refrigerated dinner rolls in a rolled up container, or do you make it? Do you know if it’s vegan? Thanks so much! Puff pastry is usually found in the freezer section at the grocery store, but unfortunately, I think it’s almost always made with butter. If you’re looking for a vegan alternative, you can put this together on a pizza crust or flatbread instead. Tank you. I will try the pizza dough.